When disturbed, fire ants are very aggressive very quickly! Fire ants are an invasive species and their painful bites can injure or kill livestock, wildlife, domestic animals and humans. Fire ants, both black and red, are an invasive species and their bites can be quite painful and deadly. Before attempting to treat for these ants, you must first identify them correctly. Numerous native ants populate the south that are actually beneficial. 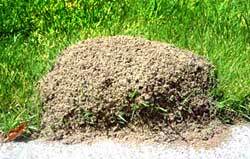 Fire ant mounds can be enormous and can cause damage to lawn mowers. It used to be that each nest had but one queen, buried up to 25' underground and supported by a complex network of other ants performing an amazing array of tasks. Now mounds are often found with multiple queens, presumably as a reaction to chemical pesticides. Those queens willing to share, have more successful colonies since it is harder to kill multiple queens than just one, and therefore their genes are passed along to their offspring. Worker ants live only a few months, but the queens live 2 years, producing about 1000 eggs a day. The nests each contain several hundred-thousand ants, and can reach densities of up to 1,000 nests per acre. Generally, mounds are 12" or more in diameter and height, although, mounds in excess of 2' in diameter and height are not uncommon in Georgia. The underground portion is a series of interlocking galleries, tunnels and chambers that may extend to depths of 1' - 5' or more, depending on soil type, age and colony size. Tunnels just below the soil surface extend laterally several yards out from the mound, with regular exits where the ants come out to search for food or attack. Controlling fire-ants is best done using a 2-step method. Although fire-ants will forage for food all year long, they typically feed on different types of food throughout the year. Before dispensing a widespread insecticide, it is better to make sure they are feeding on the type of bait you are using. Put down a small amount to confirm before proceeding. Step #1 is to broadcast an insecticide bait once or twice a year, which reduces fire ant colonies by 80 to 90 percent. Step #2 would be to follow-up with a treatment for nuisance mounds or colonies that move into the bait-treated areas. Step #2 is not always required. Late August through early October is an ideal time to apply fire ant bait to your lawn— ants are still foraging and weather patterns are more predictable so you can apply bait when no rain is expected for several days after treatment. Baits are slow-acting, taking weeks to months to reduce ant mound numbers. Remember: water ruins bates. If purchasing a fire-ant control, look for a freshness date. Fire-ant controls lose their effectiveness over time. When drought conditions exist, it may appear as though the fire ants may have gone elsewhere, but unfortunately, they usually have not and will return when the rains return.